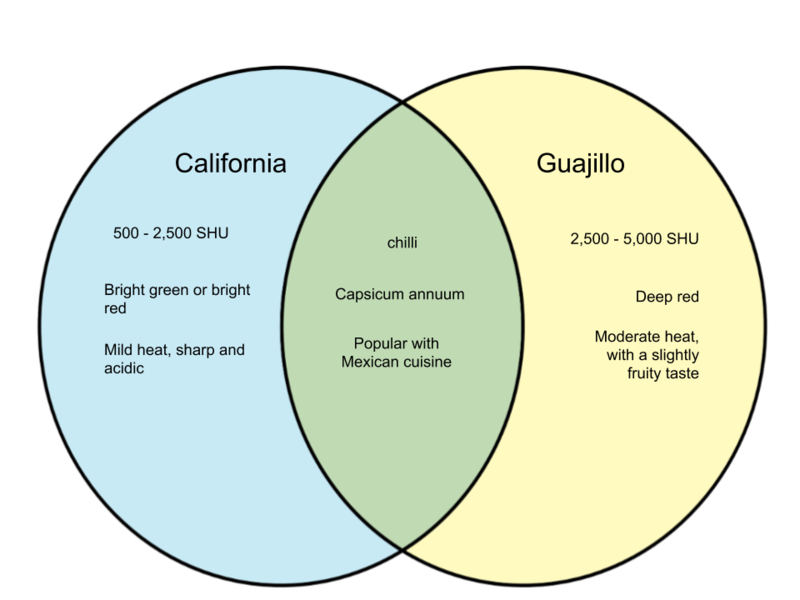 The california chilli is also known as the New Mexico chilli or Anaheim pepper. It is a relatively mild variety, ranging only from 500 to 2,500 Scoville heat units. While the heat is indeed softer than other chillies, it makes up for its sharp and acidic flavor. This type of chilli is also a popular choice for ground spice blends. The guajillo chilli is the dried form of the popular mirasol chilli, which is commonly used in Mexican cuisine. It is moderate in heat at 2,500 to 5,000 Scoville heat units. The guajillo chilli comes in two varieties – a small and hot variety called the “Puya” and the longer and wider one which has a richer flavor but milder heat. Guajillo chillies are also known for their slightly fruity taste. Description A mild variety of chilli with a sharp flavor and acidity that is often dried and used for ground spice blends The dried version of the mirasol chilli, known for its moderate heat and slightly fruity flavor. It comes in two varieties.